March 20 is the first day of spring and, for many Michiganders, it’s the most anticipated day of the year. Congratulations, we made it to the first day of spring. After the last few months of intense snow and ice—we can finally breathe a sigh of relief that we made it to the other side where there’s sunshine, warmth and no need for that trusty ice scraper. For many Michiganders, spring means warmer weather, which translates to enjoying the outdoors again. It’s the time of year where you can wear light jackets instead of being bundled up in floor-length coats with hats, gloves, scarves and more. We want to take a moment and share all of the spring-worthy activities you can look forward to in the next couple of months with these top 9 tips. Enjoy a picnic in the park. Break out the baskets collecting dust in your basement and put them to good use. It’s easier than you think. Grab a blanket, napkins, cups and a couple of healthy sandwiches from a local shop—that’s it. Go picnic your day away. Go for a hike with a friend. Not only is hiking a powerful cardio workout, it’s a great way to boost your overall wellbeing. Hiking, and general exercise, has been proven to decrease stress and anxiety. Being one with nature is a great time to enjoy the moment and realize the things that truly matter—even better when you grab a friend or family member to join you. Plant a garden. Gardening is a fun activity for you and your family. Show the kids where fruits and vegetables come from and how to nurture them from seed to stalk. Plus, there’s no greater satisfaction than eating a meal grown from your own backyard. Open your windows and listen to the rain. Many of us use relaxation apps for soothing nature noises—like waterfalls, babbling brooks and, of course, a light rain. But nothing beats the sound of a genuine, real-time spring rain. Now is the ultimate time to listen to the raindrops. Next time there’s a rainstorm, crack your window and close your eyes. You’d be amazed at how relaxing it is—you may just end up falling asleep. Take your run outdoors. Lace up your shoes and hit the pavement outside. Not only will the fresh air do you some good, but you’ll activate more muscles. How? You aren’t running on a treadmill or track anymore, which is a straightforward motion. Running outside gets you to take more turns, hills, pass others on the sidewalk and more—all great ways to engage more muscles. Go on an evening walk with a companion. Add a walk to your daily calendar after you eat dinner. 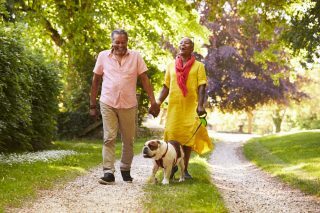 Not only is this a great time to connect with your partner or other family members and friends, but walking after meals also benefits the digestion process. Get your friends together for a round of golf. 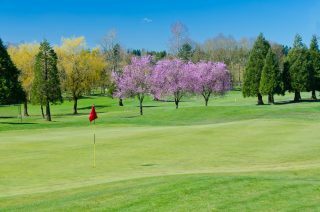 Spring is the beginning of golf season in Michigan. Nothing says ‘hole in one’ quite like your first tee time. Add more exercise to your game by ditching the cart and walking the course. Sit outside at a café or restaurant. One of the many reasons why Michiganders love warm weather is sitting outside at your local hotspot. You can’t beat enjoying your favorite coffee or lemonade while getting some good old vitamin D.
Mark your calendars, break out the lighter jackets and add a couple of the activities to your to-do list—spring is finally here.